Asia boasts the fastest growing online gambling market in the world which is anything but surprising, considering the continent is home to over 60% of the population on the planet. The rapid pace of growth in this sector can be attributed to the technological progress in the past decade, with an increasing number of people gaining access to desktop computers and mobile devices. Asians are known for their passion for partaking in gambling activities, which are a common form of recreation in their culture. In China, for instance, gambling is often part of different social events like parties and even weddings, where it is not that unusual to see a group of guests seating in a corner, engrossed in Mahjong, one of the most popular games on the continent. What is more, Asia has a rich history as far as gambling is concerned. Many popular games originated from this continent. Some historians suggest the popularity of the lottery-styled game Keno (invented by the Chinese) contributed to funding, necessary for the building of the Great Wall. Legends have it entire kingdoms in India were won and lost on dice rolls. It makes sense that this passion extends to online gambling as well, with an increasing number of Asian players enjoying the benefits of being able to bet on their favorite casino games from the comfort of their surroundings. Online gambling operators cater to this mounting demand as well as to the needs of players from the continent. Registrations from Asian players are accepted at some of the most reputable web-based casinos, which support widespread Asian currencies like the HKD, CNY, and JPY. Players from the largest countries in Asia are given the opportunity to manage their casino accounts, process payments, and partake in promotional offers in a convenient and hassle-free manner since some of the biggest operators in the industry support widespread Asian languages such as Chinese and Japanese. We will tackle the legality and regulations regarding online gambling in Asia in further details below. Being the largest continent on the planet, Asia accounts for the biggest gambling market in the world and has managed to achieve a consistent growth in gambling revenue in the last few years. 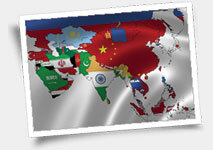 Many of the global trends in the industry are also prevalent in the Asian gambling markets. For instance, there is a shift toward online gambling as well as an increase in the popularity of gaming on the go via commonly spread portable devices, such as smartphones and tablets. In some Asian countries like Macau, and the Philippines, for example, the general trend leans toward building the so-called integrated casino resorts. These mammoth structures offer tourists a range of recreational activities to spend their money on, including luxurious casinos, shopping centers, exquisite accommodations, fine dining restaurants, and entertaining shows. The integrated-resort model works to the advantage of Asian countries’ governments since it helps boost the profitability of the local casino industry – this way, gambling establishments are less reliable on high-rollers. Apart from this, some of the biggest changes that occur in the Asian market have to do with the regulations in regard to gambling. Similarly to European countries, each state in Asia is individually responsible for the enforcement of its own gambling regulations and laws. The interactive gambling legislation varies wildly from one country to another. While the brick-and-mortar casino industry on the continent is thriving, the same cannot be said for online gambling which is prohibited in a large number of Asian countries. Despite that Asian players succeed in finding various loopholes which allow them to register and play at established online casinos, with VPN access being the most common solution to the issue. In some Asian countries, all forms of brick-and-mortar gambling are allowed in certain areas but remain illegal in others. A number of jurisdictions prohibit only certain forms of landbased gambling. Since the government of each Asian country has come up with different regulations in regard to landbased and online gambling, there are dramatic differences in the legislation of the individual markets. Because of this, we invite our readers to take a closer look at the Asian gambling industry country by country. Singapore has become one of the biggest gambling hubs in the world ever since the local government decided to pass a legislation, allowing landbased casino gambling on the territory of the country as of April 2005. This piece of legislation included several provisions against the potential negative effects of landbased casinos. The local landbased gambling sector was capped at two licensed operators only. In addition, the integrated resorts on the territory of the country are allowed to dedicate no more than 5% of their interior space to gambling venues. In an attempt to dissuade the locals from partaking in gambling activities, the authorities have also imposed an SGD100 entry fee (or around USD80.50) for Singapore citizens who wish to enter gambling establishments. The so-called “family exclusion order”, on the other hand, allows family members to restrict the access to casinos of relatives who battle pathological gambling. Unfortunately, Singapore has adopted a rather restrictive policy as far as online gambling is concerned. In 2014, the Remote Gambling Bill was passed and effectively rendered all forms of online gambling illegal in Singapore. The only exceptions to this rule are operators that have received a special license by the local authorities. It makes sense that advertising and promoting gambling-related activities on the web is also against Singapore law. So is processing financial transactions to and from online casinos. The regulations are so stringent that the government has requested Internet providers to block the access to foreign gambling sites – those, who fail to comply are facing hefty fines. Singapore is also among the countries where players who fail to abide by the law are persecuted and face up to six months behind bars. In addition, a fee is imposed on the violators. The legislation pertaining to gambling activities on the territory of the Philippines may seem a bit perplexing and even contradictory at first glance. Gambling in the country is regulated and overseen by two different regulatory bodies. The Philippine Amusement and Gaming Corporation or PAGCOR is responsible for the licensing and regulation of all allowed forms of landbased gambling, such as bingo, sports betting, and casino games of chance and skill like poker, blackjack, and roulette. PAGCOR also issues licenses for the so-called e-games, which are not to be mistaken with online casino games since the term refers to bingo and other similar games which are connected to terminals at landbased gambling facilities. Online gambling is also allowed as long as the operators have obtained a license by CEZA, which stands for the Cagayan Economic Zone Authority. The contradiction here arises from the fact that CEZA-licensed online gambling operators are not permitted to offer their services and products to Philippine residents while at the same time are given the green light to service customers from other Asian markets. Meanwhile, Philippine players are free to gamble at foreign websites thanks to a Court of Appeal decision that was issued back in 2012. Since the law did not explicitly state online gambling was illegal, there was no way to persecute Philippine players for partaking in such activities. Thus, gambling on offshore casino platforms is technically legal. Filipinos are practically free to join foreign casino websites as long as the latter accept registrations from this country. Macau is a special administrative region, located on the southern coast of the People’s Republic of China and is known as one of the most densely populated places on the planet. This territory was a Portuguese colony in the past and boasts a rich gambling history as partaking in such activities has been legal since the mid 19th century. It is hardly a surprise then that in present days, the city enjoys a reputation for being one of the largest gambling hubs in the world, with its gambling revenue overtaking this of Las Vegas. Gambling is booming in Macau to such a great extent that the city was even nicknamed the “Monte Carlo of the Orient”. Logically, it follows that landbased gambling in Macau is legal for both locals and tourists as well as they are of legal age, which is 21 years old in this instance. Players can legally wager on sports, casino games, lottery, and poker. The main government entity responsible for licensing and overseeing landbased gambling activities in the country is the DICJ, which stands for the Gaming Inspection and Coordination Bureau. The unique thing about Macau is that its legal system does not differentiate gambling legislation as a separate branch of the law. Instead, it functions as a collection of many different legal topics, which pertain to gambling, including criminal, tax, administrative, constitutional, and contract laws. The regulations on landbased gambling cover a range of aspects, including what types of games can be legally offered in landbased venues, the taxes on gambling revenue, and the licensing of brick-and-mortar casinos. In recent years, there is a boom in landbased gambling as Macau is home to over thirty brick-and-mortar casinos, some of which are owned by major operators the likes of Las Vegas Sands, MGM Resorts International, and Galaxy Entertainment. Meanwhile, Macau has not introduced any regulations in regard to online gambling, at least not at the time of writing this article. Since the law does not expressly state betting on the web is illegal, many players from Macau choose to join one of the numerous foreign online casinos which accept registrations from this jurisdiction. Currently, this administrative region does not issue licenses for online gambling operations within its territory. In mainland China, most forms of casino gambling are considered illegal. The ban covers poker, Mahjong, and casino games like blackjack, roulette, and craps. The only forms of gambling the Chinese government has not prohibited are the lotteries, scratchcards, Keno games, and slot machines. Sports betting is also legal, with the Chinese Sports Lottery having a monopoly on this sector of the local market. Many Chinese residents prefer to travel to Macau in order to play at landbased casinos where they are able to choose from a wider range of gaming options. It is worth mentioning the Chinese authorities are predominantly focused on persecuting unauthorized gambling operators, promoters and “professional” gamblers. The repercussions for recreational players are less severe. While it is possible to arrest citizens for partaking in prohibited forms of gambling, such as Mahjong, this happens on very rare occasions only. The rules regarding online gambling coincide with those that apply to landbased gambling. Operating online gambling websites and providing such services to Chinese residents is considered illegal. Players from the country are practically prohibited from accessing offshore gambling sites. Although it is possible to get arrested for playing at unauthorized foreign websites, this rarely happens. However, the Chinese government has taken stringent measures against citizens gambling at offshore websites. Players from the country are unable to access some online casinos because their websites have been blacklisted and blocked by the local Internet service providers. In addition, Chinese players who have succeeded in registering at offshore casinos may experience difficulties in processing deposits with their credit or debit cards. This is to be explained with the fact Chinese financial institutions often block payments to and from foreign gambling websites, which causes players from the country to resort to using e-wallets and Bitcoins, among other alternative methods of payment. Despite the illegal status of online gambling in China, some of the most reputable operators in the industry continue to accept registrations from this country. In many cases, it is possible for Chinese players to receive customer support and manage their casino accounts in their native language. Some websites support the CNY as a currency which prevents players from incurring currency conversion fees. Most forms of gambling on the territory of Japan are proclaimed illegal, with a few exceptions only, such as scratchcards, lottery, and sports betting. Pachinko, which resembles arcades to a great extent, is among the most popular forms of landbased gambling in the country. At the present moment, there are no legally operating landbased gambling venues to offer traditional casino games like blackjack, roulette, and poker to Japanese citizens. However, this is to change in the near future since Japanese lawmakers have already passed a bill to legalize landbased casino gambling in the country, which is expected to come into effect in 2020. Meanwhile, online gambling is currently not allowed for the most part, with players being able to bet only on lotteries, scratchcards and certain types of racing and sports. However, since the government does not take strict measures to prevent citizens from gambling on the web, players from Japan are often able to access the websites of foreign casino operators and enjoy a wider range of options, including virtual casino games, poker, fixed-odds betting and bingo. Since authorities are not blocking or restricting the access to the websites of foreign operators, players can easily register at a variety of online casinos. Many of the online gambling operators to accept players from this jurisdiction also accept the local currency, JPY, and list Japanese among their supported languages. Similarly to Macau, Hong Kong is also a special administrative region, part of the People’s Republic of China. After the Gambling Ordinance of 1977 came into effect, landbased gambling in this region became legal, but strictly regulated. Thus, Hong Kong is home to a great number of brick-and-mortar gambling establishments, where it is possible to legally partake in traditional games like poker, blackjack, and roulette, to mention just a few. Other forms of landbased gambling in the region, such as lotteries, sports betting, and horse racing, are organized exclusively by the Hong Kong Jockey Club. When it comes to interactive gambling, things are a bit more complicated since betting online is considered illegal on the territory of Hong Kong. The good news is there is no practice among authorities to block the websites of offshore gambling operators which is to say players from Hong Kong can easily access them and open real-money accounts to wager on a variety of casino games, poker, slots, bingo, and sports. What is more, there are no known cases of Hong Kong players being persecuted for partaking in unauthorized online gambling. South Korea is among the few nations in the world where online gambling is considered a criminal act. Landbased gambling, on the other hand, is legally available predominantly to foreigners. There is one exception to this rule, however, since South Koreans are allowed to enter and gamble in one landbased casino only, the Gangwonland. Both offering and participating in online gambling activities is deemed a criminal offense by Korean law, with online lottery tickets being the only exception to this rule. The local authorities are rather unrelenting in this respect since habitual players, who are caught in violation, risk facing persecution along with paying a fine of KRW5 million, which corresponds to about $4,300. Meanwhile, individuals who organize and conduct unauthorized gambling are naturally persecuted and if found guilty, may spend up to five years in prison. The South Korean government is rather pervasive when it comes to censorship, with the websites of offshore interactive gaming providers being blocked by the Internet service providers in the country. Nevertheless, South Korean players may be able to register at the websites of big casino operators like 888 and Ladbrokes, despite these restrictions. The most widespread course of action among players from the country is to use a VPN service to mask their IP address. Similarly to the situation in other Asian countries, the legal landscape in regard to gambling in India is rather perplexing and complicated. This can be attributed to the fact that the country consists of 27 states and each one has its own regulations and rules. From this, it follows that the legal status of gambling varies from one Indian state to another. According to the Public Gambling Act of 1967, the operation and participation in gambling activities are punishable either by imprisonment or by a fine. There is one exception to this rule and it applies to games of skill, which is to say landbased poker is generally legal in the country. Other legal forms of landbased gambling in India include lotteries and horse racing, which for some reason also fall into the category of games of skill. Landbased casino games are deemed illegal throughout the most of the country with the exception of a few states only. Online gambling, on the other hand, is not regulated in India at the present moment, but the first steps towards introducing regulations have already been made. As usual, there is an exception to all rules and this is the case here since Sikkim is the only Indian state which boasts its own online gambling regulations, thanks to the enforcement of the Sikkim Online Gambling Regulation Act in 2008. Thus, the state can issue licenses for offering interactive sports betting, Keno games, baccarat, poker, bingo, roulette, blackjack and Casino Brag, among several other games. Possibly, we will see online gambling regulations being adopted in several other Indian states in the future. Despite that, Indian players can access the websites of foreign gambling operators and place their bets there. Players are generally not persecuted by law for online gambling but foreign gambling websites are often blocked by the local Internet providers and sometimes it is impossible to process payments via MasterCard and Visa. Because of this, many Indian players resort to using VPN services to access the blocked offshore casinos. Prior to the fall of the communist regime, gambling in Vietnam was strictly prohibited by law. These restrictions became less stringent in the mid 1990’s which is not to say Vietnamese residents are free to partake in all forms of gambling. As a matter of fact, Vietnam is among the few countries in the world where locals are actually sent to prison for two to seven years if they happen to win or lose over VND50 million, which corresponds to about USD2,000. So far, the only allowed forms of gambling in the country are the Vietnam Lottery, as well as horse and greyhound race betting on state-owned tracks. At the same time, tourists are not subjected to the above-mentioned prohibitions. The landbased casinos throughout Vietnam are mostly run and managed by foreign companies. Vietnam is also the country where a strict Internet censorship is at hand, so it is anything but surprising that all forms of online gambling are prohibited there. Furthermore, many foreign gambling websites are blocked by the local Internet service providers. This censorship by no means prevents players from accessing the websites of offshore gambling operators as they typically use VPN networks to load the foreign online casinos. What is more, many established web-based casinos cater to the needs of players from Vietnam and therefore, accept payments from the banking institutions in the country. Thailand is also among the Asian countries where legal gambling is restricted only to the National Lottery and horse-race betting on the state-owned racetracks in the capital Bangkok. One of the most important pieces of gambling legislation in the country is the so-called Gambling Act, B.E. of 1935, which makes a rather weird distinction between List A and List B types of gambling games. List A covers wagering on animal games that are considered more violent, such as dogfights, as well as games of chance like roulette and slots. List B covers all other forms of gambling, including but not limited to bingo, sports betting, and raffles. The penalties for illegally playing games in the first category are more severe as those who are found guilty are expected to pay a fine of up to THB5,000. In some extreme cases, the violators are sent to jail for up to three years. The penalties for individuals who have illegally engaged in List B games are milder, so to speak, as they have to pay only THB1,000 in fines and will potentially spend only a year in prison. Interestingly enough, in Thailand, it is illegal to even sell or own “unauthorized” decks of playing cards and residents of the country have the Playing Cards Act, B.E. 2486 of 1943 to thank for that. All in all, the legal landscape in regard to gambling in Thailand is extremely rigid, which has resulted in a boom of the illegal gambling market in the country. Unauthorized bookmaker shops and gambling dens are widespread throughout Thailand. Players from this jurisdiction often opt for joining foreign gambling websites where they can partake in sports betting, poker and other casino games. There are no known instances of players being legally persecuted for gambling from the comfort of their homes via foreign online gambling platforms. Similarly to players from India, Vietnam and South Korea, residents of Vietnam often need to resort to VPN networks in order to access the offshore interactive casinos since the local government has already blocked many of the websites.